Biotin is a popular equine feed supplement that is often recommended by farriers as a way to improve the quality of the horse's hoof and as a treatment for dry cracked hooves. This advice is given because the vitamin Biotin is a sulphur which contains B vitamins, which help in maintaining good growth of the hoof horn. Added a horse or pony's feed over a period of months a supplement containing biotin can improve the problem of dry, cracked, brittle or generally bad feet. Horses or ponies that often pull their shoes off or those with chronic or recurring laminitis can also often benefit from being fed a biotin supplement. 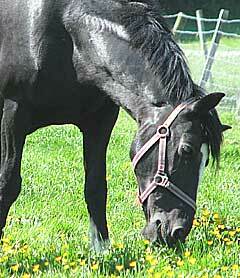 Horse naturally get biotin from grazing on good quality pasture - this is the best source of biotin. High Levels of biotin are also found in alfalfa. Other good natural sources of biotin with moderate levels of this useful vitamin are barley, oats and soyabean meal. WHEN, & HOW MUCH, BIOTIN FEED SUPPLEMENT SHOULD YOU GIVE TO A HORSE? A horse or pony makes B vitamins in its large intestine during the breakdown of fibre. The absorption of these B vitamins, in addition to those received from being fed a well-balanced diet, normally provides an adequate level of vitamins for a horse. Biotin, being a water-soluble vitamin, is not stored by a horse for very long. Any of the vitamin not used by the body cells will be passed out in the urine. So - if you have a horse with poor feet, a biotin vitamin supplement should be given daily in its feed. Although results of studies show the amount of biotin needed by a horse is unclear -the recommended daily dose of Biotin is 15 - 20 mg per day - this is the amount generally recognised as being needed to promote quality and healthy horn. HOW TO CHOOSE THE BEST EQUINE BIOTIN SUPPLEMENT FOR A HORSE? Avoid choosing an equine hoof supplement which just contains biotin. There are other ingredients which should be added as a complement. These elements include calcium, zinc and methionine. Not all horses with hoof problems will have a biotin deficiency, a true biotin deficeincy is very rare, - by only supplementing the feed with biotin alone, the hoof can take longer to repair and heal than with a broader selection of vitamins and nutrients. HOW LONG DOES A HORSE'S HOOF TAKE TO REGROW? A horse's hoof normally takes between 9 months to a year to re-grow - growing from the coronary band downwards. So it is important to continue to add biotin to the diet over several months to see any real benefits of this treatment. If you are feeding a biotin supplement to try to improve dry or brittle hooves don't be disappointed if you don't see immediate results! At the time of writing there have been no adverse effects of feeding biotin reported.